This idea of art as a journey which artist Grimaldi Baez described while speaking to a group of students from the Philadelphia Photo Arts Center on the first day of the open studio hours for the Extension or Communication: Puerto Rico project at Taller Puertorriqueño also informs the question that shapes the exhibit: How can individuals, communities, and an entire nation cross the physical, political, and cultural-imaginary distance from Puerto Rico to the U.S. mainland to better understand the devastation that the island continues to suffer in the aftermath of Hurricane Maria, and the colonialist structure imposed on the U.S. territory which has exacerbated that devastation all the more? The exhibit forces the viewers themselves to make that journey with the artist. 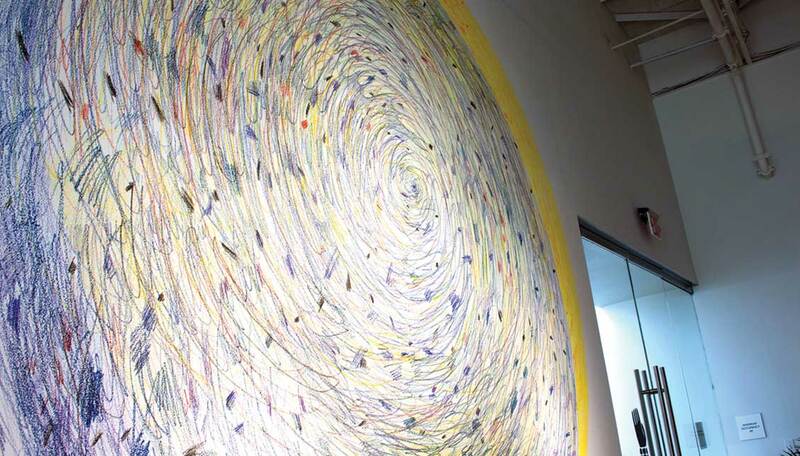 Going from maps of the flood plains of San Juan, to film photos of Puerto Rico strewn across a table, to a giant crayon drawing on the wall of a solar eclipse, the artists invite those who enter the room to create their own connections and fill in the spaces between and within the artworks presented. 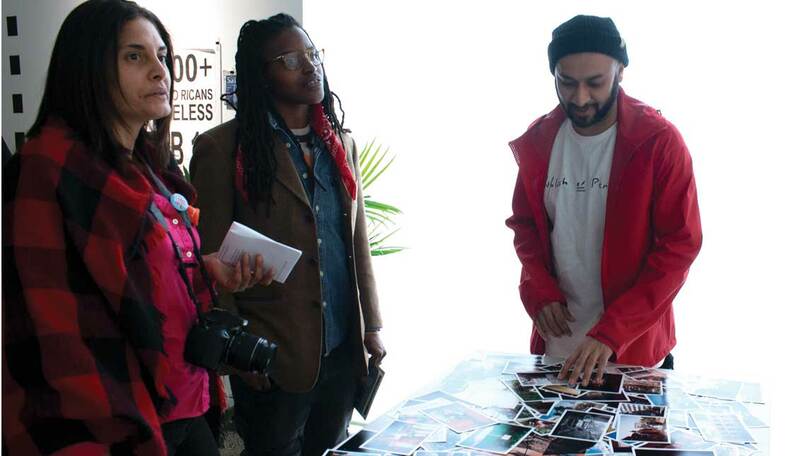 The multi-disciplinary collaborative project was initially conceived by Baez, a Puerto Rican visual artist based in Philadelphia, along with local artists and organizers Sheldon Abba and Ricky Yanas. The project collaboration has grown since its first showing at Tiger Strikes Asteroid Philadelphia, where it ran from Jan. 11 to Feb. 17. Guided by Abba, Baez, and Yanas, as well as Jessi Ray Koch, city planner and urban designer, and artist José Ortiz-Pagán, other contributors include Tania-María Ríos Marrero, community organizer for the North Philadelphia public library, Charíto Morales, registered nurse and social justice activist, and Raquel Salas Rivera, the 2018-19 Poet Laureate of Philadelphia. Collaborator Jessi Koch said that the exhibit is “about the human interactions as much as the interactions with the work” in order to highlight the experience and needs of those displaced by Maria. “We hope through this project, as we’re learning more about the needs of displaced people who are here in the community, that we’ll be able to use our resources and our network, and then also even just the visibility that comes with having an art show to be able to help make those connections as much as possible,” Koch said, explaining that the exhibit at Taller is building on the project’s initial showing at Tiger Strikes Asteroid Philadelphia. That exhibit, Koch said, led to collaboration with a group fighting to raise awareness about the expiration of FEMA vouchers in Puerto Rico, a “powerful experience,” Koch said, which represents the potential of the project to cultivate community engagement. The project collaborators chose this kind of “open form” to invite participation, they told their visitors in the studio on April 10. The artists emphasized that they each bring their own expectations, desires, and experience to the project, and are inviting community participation so that others do the same, as they plan to incorporate public events, meetings, and screenings into the monthlong exhibit. “Is the show addressing more what’s happening there or what’s happening here? Both. They’re one in the same. What’s happening out there is affecting people in this community, is bringing people from there directly into this community, so they are the same thing,” said Abba. Baez told the group that for him, “it’s been a very personal process” which hasn’t always been easy. To illustrate his point, Baez pointed to his drawing in the exhibit, a dark circle over a yellow one, stretching almost to the ceiling: an eclipse of the sun by the moon which he said represents the necessity of shedding light on Puerto Rico’s personal and political pain. “Sometimes it feels like you’re walking blindfolded through a minefield because this is my life in a lot of ways. This is my uncle’s house, this is my grandmother’s house, these are real places for me that are loaded with a lifetime of experience,” he added. There is no solution, no simple answer to Puerto Rico’s struggle, and in that sense the artists have strived to show that there is no one way to document or to respond to it. For her part, said Koch, the future of the project may extend past when the exhibit space at Taller closes on May 5.